by Geoffrey Ciani – It is a rare occurrence in boxing to see two elite talents both in their primes squaring off against each other. Therefore boxing fans have reason to celebrate, because this Saturday night unified super middleweight champion Andre ‘S.O.G.’ Ward (25-0, 13 KOs) will defend his belts against light heavyweight title holder ‘Bad’ Chad Dawson (31-1, 17 KOs). Both combatants deserve credit for making this match happen, especially in a day and age where all too often the best are reluctant to face the best for various different reasons. Not only are Dawson and Ward two of the most talented pound-for-pound boxers in the world, they are also arguably coming into this contest following the apex of their respective careers. This just serves to further amplify the appeal of an already intriguing match-up. The story in the lead-up to this fight has largely focused on the weight. This fight will be taking place at the 168 pound super middleweight limit. Chad Dawson is a big light heavyweight, and he last made the 168 limit for a fight more than six and a half years ago. As a result many observers have questioned Chad’s ability to move down in weight and compete effectively, and not without good reason. After all, boxers who drop weight often become physically drained, and that typically leads to decreased stamina, power, and punch resistance. This has helped create the perception that Dawson will be entering this contest compromised, giving Ward an inherent edge. The fact that this bout is also taking place in Ward’s hometown of Oakland gives the appearance of an additional advantage for Ward. Personally I do not believe the weight will have a significant impact on the outcome of this match. While it is true that guys coming down often struggle, as was the case when Oscar De La Hoya unwisely ventured south to welterweight to secure a mega-fight with Manny Pacquiao, there are exceptions to the rule. Recently, for example, Zab Judah recaptured a portion of the junior welterweight crown after he had campaigned at 147 for more than six years. While history may be stacked against him, in the case of Chad, I believe he will be able to adequately cope with the weight loss. Dawson is 30 years old and in his physical prime. He was the one who stated he could make 168, and until proven otherwise there is no reason not to believe him and his team. I therefore maintain that whoever wins this contest will do so strictly on merit. In other words, simply put, the better fighter on this night will emerge victorious. But who will win? This becomes a tricky proposition because this is a true 50-50 pick’em type of fight. Andre Ward is an exceptional boxer with an outstanding pedigree. I have long felt that Ward would beat anyone south of cruiserweight. If there was one man who could defeat him, however, I have always believed that boxer was ‘Bad’ Chad Dawson. Even still, these past few months I have favored Ward in the lead-up to this match-up, and have done so for two main reasons: (1) Ward’s superior ring IQ, and (2) Dawson’s history of losing focus and suffering from mental lapses. Ward is incredibly smart inside the squared circle, and has a proven ability to change and adapt to the situation at hand. He is also extremely versatile and can win fights through various approaches and strategies. With Ward’s mental strength and Dawson’s history of spacing out, the idea that Ward would ultimately frustrate Chad and take him out of his rhythm seemed logical. In recent weeks, however, I began to have a change of heart. While Dawson has had a tendency to suffer from mental drift, in recent fights he has exhibited far better concentration. This all started following his unexpected loss at the hands of Jean Pascal. Dawson later claimed that he took Pascal lightly and overlooked him a bit, and if this is true he has no one to blame but himself. Regardless, a fighter’s character is often defined by how he bounces back from a loss, and in the case of Chad Dawson, he has quietly rebounded in superb fashion. In doing so, he has exhibited the type of mental strength and determination that he was often criticized for lacking in the past. Despite having a rematch clause against Pascal, Dawson was forced to sit on the outside looking in while Pascal twice battled against the ageless warrior Bernard Hopkins. It was a situation that certainly must have been frustrating for Chad. Then when Dawson finally got his chance to face Hopkins himself after Bernard bested Pascal, he had to endure the unsatisfying ending of their first encounter which was ultimately rendered a ‘No Contest’ after initially being ruled a technical knockout win for Chad. The Hopkins rematch, however, is where Dawson truly proved his mettle. In the early middle rounds of that contest, the crafty veteran began doing what he does best when he imposed his will on Dawson and appeared to be getting into his head mentally. Dawson, however, persevered. In between rounds he received good advice from head trainer John Scully and he responded well and got himself back on track. It was the first time I recall seeing Chad remain focused and determined throughout the full twelve round duration, and he was very effective in executing his game plan. The end result was a decisive win for Dawson against a man who had not been clearly beaten since 1993. What was most impressive was the way Dawson remained calm and collected under fire. He maintained his composure, and I think this was largely due to his new mindset and the unique chemistry he shares with his trainer. Ward, of course, still has the superior ring IQ and this might well still see him to victory. In order to beat Dawson, however, Ward not only needs to utilize his ring smarts, but he also needs to be able to perform and cope with Chad’s style. This will be no easy task. Andre has never fought anyone quite like Chad in the pro ranks. While Dawson may not be as intelligent as Ward, he is still an outstanding technician with tremendous skills and athleticism. In other words, just because Ward knows what he needs to do in order to be successful does not necessarily mean he will actually be able to do it. Dawson is a tall southpaw who works behind a good jab and a nice left hand. Ward is going to need to keep the fight at close or mid range to have his greatest level of success, and this is easier said than done. The one fighter who gave Ward the most trouble in recent years was Sakio Bika. Following that fight, Ward admitted to me in an interview that it took him six or seven rounds to make the necessary adjustments in that fight. While Bika’s style is nothing like Dawson’s, the point still remains: If it takes Ward six or seven rounds to solve the jigsaw puzzle which is Chad Dawson, it might be too late. This fight probably will not be the type of exciting encounter that appeals to casual fans, but for die-hard boxing fans it could wind up being a tactical chess match for the ages. Ward is the favorite in this one, but I am expecting an extremely competitive clash of styles that showcases the finer and more subtle aspects of the sweet science. Ward right now stands on the brink of greatness. Coming off of an extremely impressive run that culminated with him winning the Super Six Boxing Classic, many observers already view Ward as a top five pound-for-pound talent in the sport. What many people forget, however, is the fact that prior to his loss against Pascal, Dawson was approaching the same type of praise and recognition himself. Many fans are also overlooking the fact that Chad has endured and overcome a great deal since the loss to Pascal and this helps build character. People often criticized Chad for never putting it all together. Even prior to his only professional loss, there always seemed to be something missing despite all of his skills, speed, and raw athleticism. 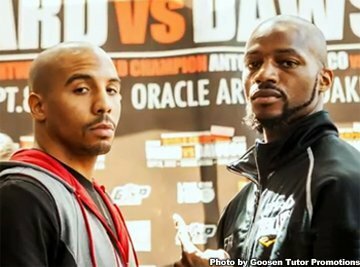 While I will not be surprised if Andre Ward emerges victorious, and would not even be shocked if he won convincingly or even dominantly, I believe this will be the night that ‘Bad’ Chad Dawson finally puts it all together. I see Dawson using his jab to control the action from the outside, and I think he will mostly hold his own against Ward whenever he finds his way inside. Andre will undoubtedly have some success ripping uppercuts and hooks while engaged in close quarters and half clinches, and I suspect we will frequently see Ward lunging in with lead rights that often find the mark. But I believe Dawson will effectively minimize the damage and quickly reestablish his optimal range whenever this happens. This is the opportunity Dawson has long waited for, and I think he will seize the moment. It will be close, and perhaps even somewhat controversial to some, but I am picking Dawson. While I suspect a lot of rounds are going to be extremely competitive and maybe even difficult to score, I think Dawson is going to surprise and silence a lot of critics with his performance against S.O.G.